WARNING: This is a ridiculously long and extraordinarily picture heavy post, so you might need a brew and a biccie to get through this one! The previous night we arrived quite late into Los Angeles after being at San Diego Zoo all day, and then travelling up the coast to see Newport Beach and Huntington Beach on the way. We weren’t actually able to get out and have a wander in these places because we couldn’t find any easy parking and we didn’t want to be too late getting to LA. But we did catch a glimpse from the car! 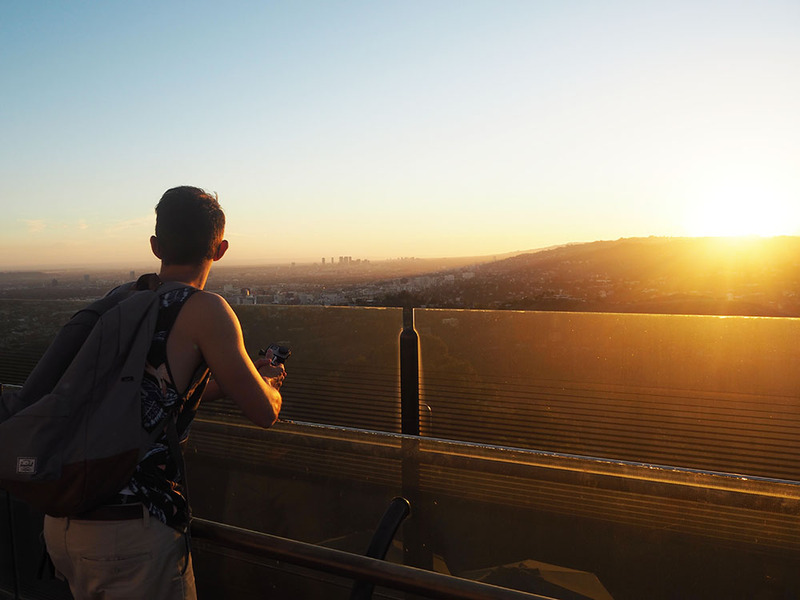 So we arrived in LA at the Loews Hollywood hotel in the evening and actually had a free room upgrade to a ‘Capitol View’, we didn’t really realise what that meant until the following morning as it was dark and we couldn’t see much of the view. 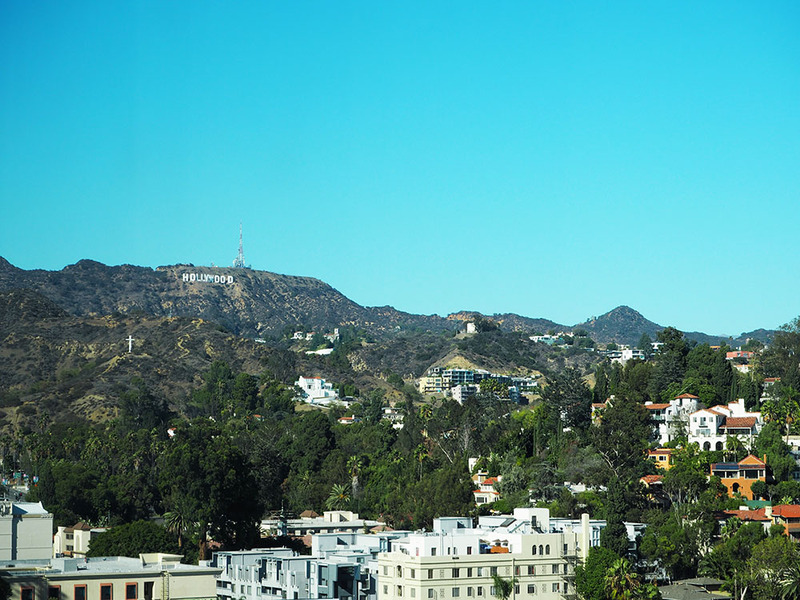 But when we opened the curtains in the morning the view that greeted us was the picture above, the Hollywood sign in all its glory, and also Capitol Records, hence the name Capitol View! Such an awesome view, I’m still quite shocked how awesome it was, I wish I was back there! 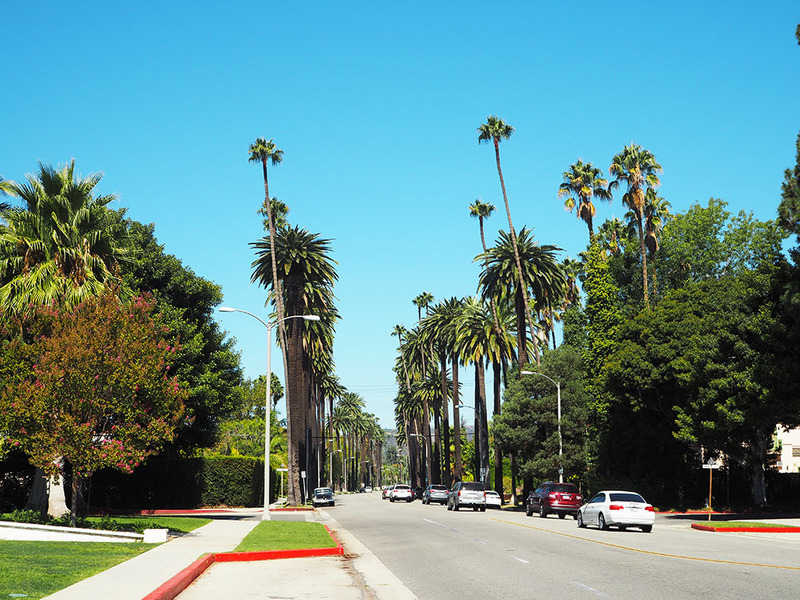 On our first full day we had booked the ‘Grand Tour of LA’, so we caught the shuttle bus to the tour office and then hopped on our coach ready to explore the sights and sounds of the City of Angels! 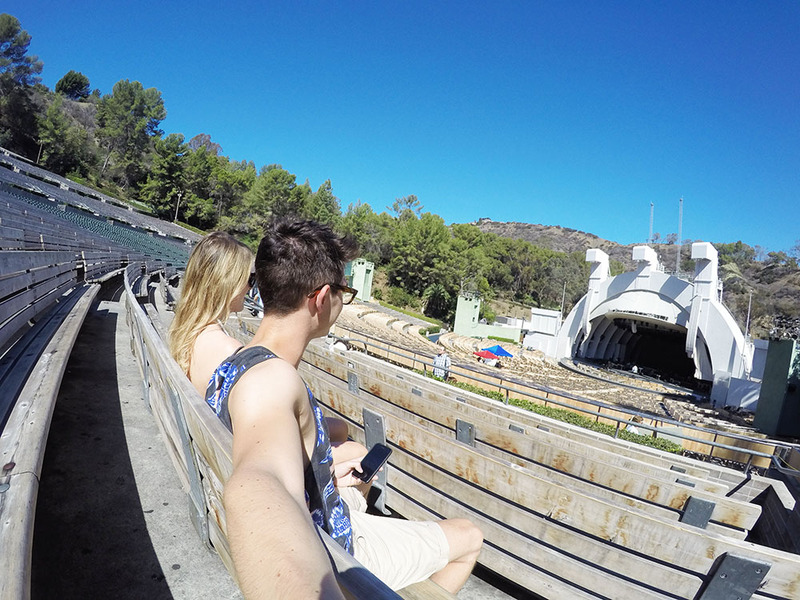 First stop, the Hollywood Bowl! Amazingly we were actually allowed into the arena, so naturally we took our seats and pretended we were there for a show. 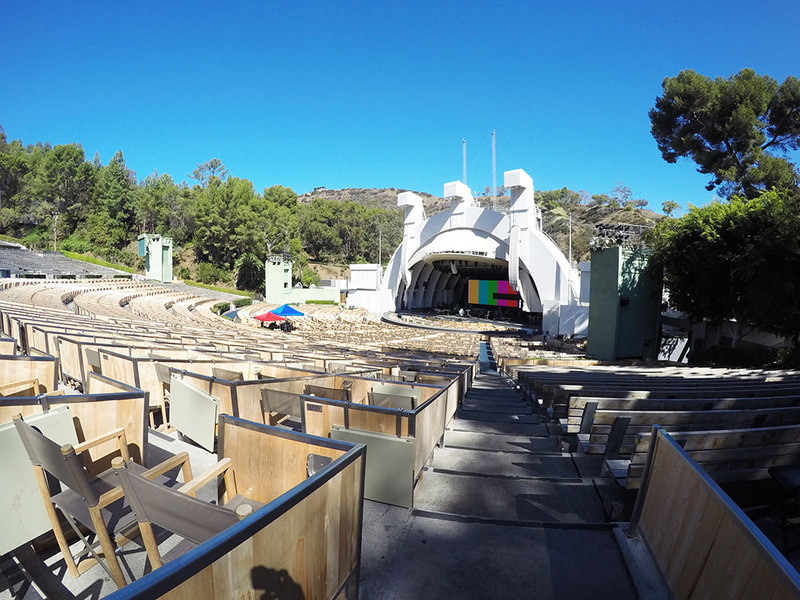 It’s now 100% on my bucket list to go back to LA and see a show at the Hollywood Bowl. 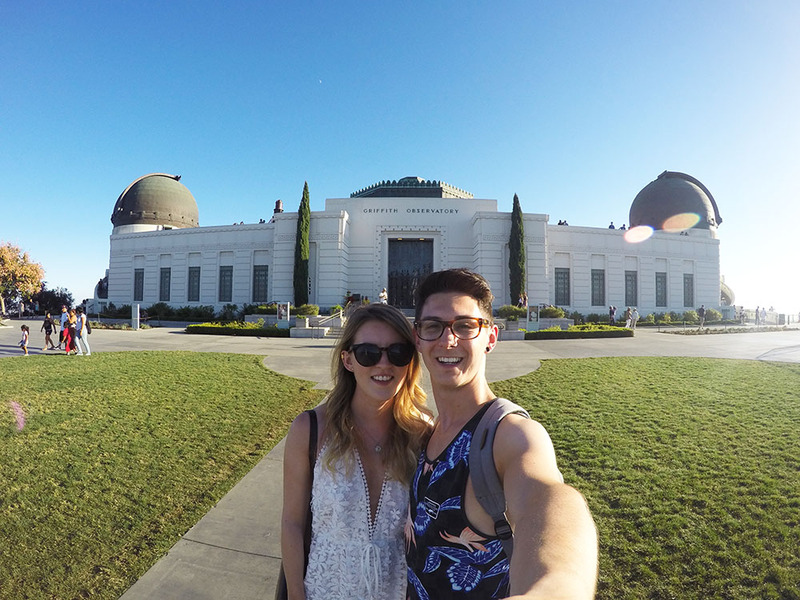 Our next stop was at the famous Beverly Hills sign, an absolute must in LA. The only problem we had on our tour was the temperature, it was around 36 degrees all day, not ideal sight seeing weather! Even wearing this outfit I was roasting! 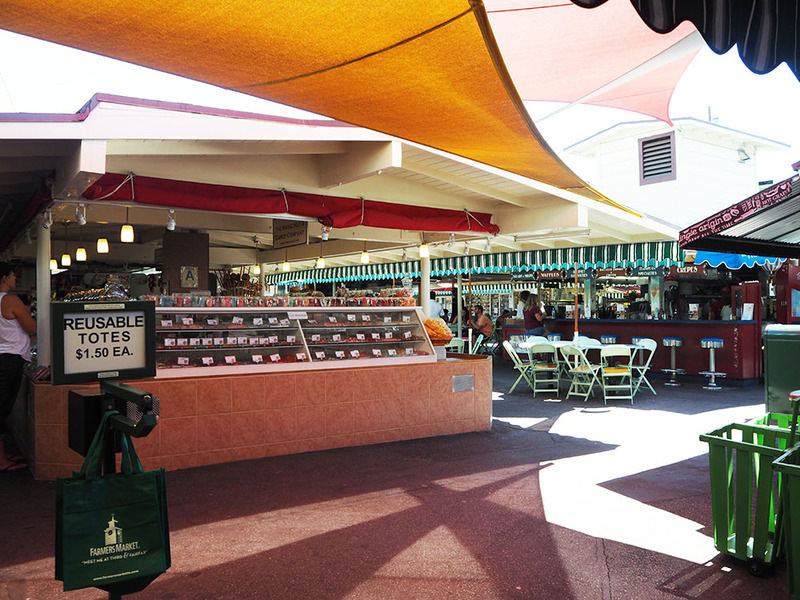 For lunch we had an hour stop at The Grove and the Farmers Market. Luckily, I had been before when I went with my mum back in 2010 so I knew roughly where things were so we could make the most of our hour. 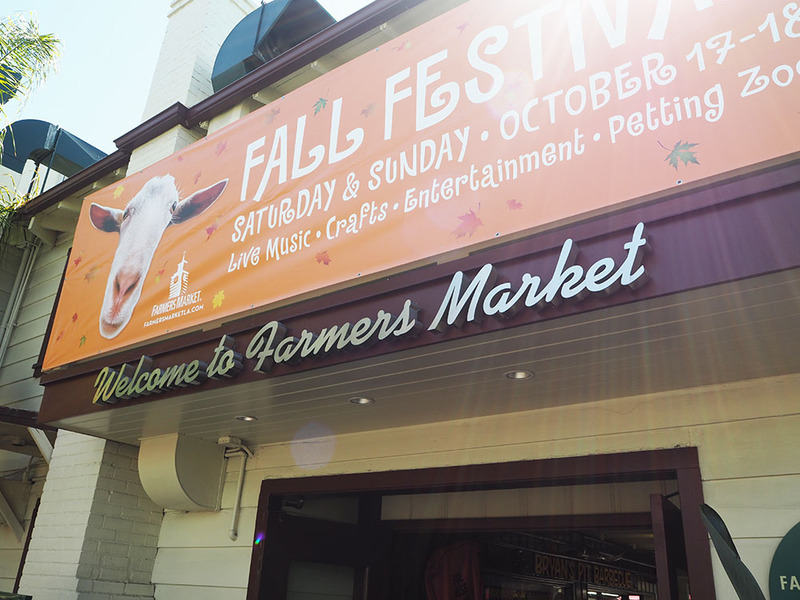 Our first port of call was a little wander around the Farmers Market. 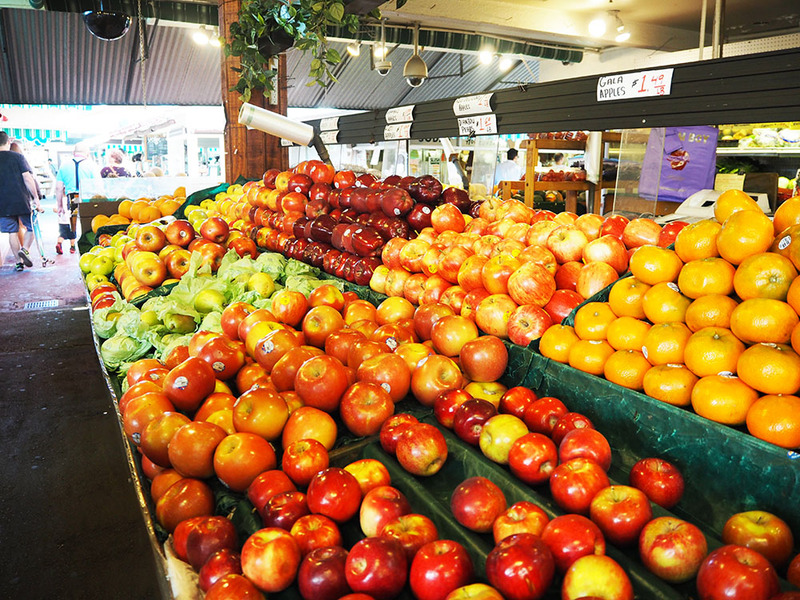 There was just so much gorgeous food on display everywhere you looked, its a foodie’s heaven! 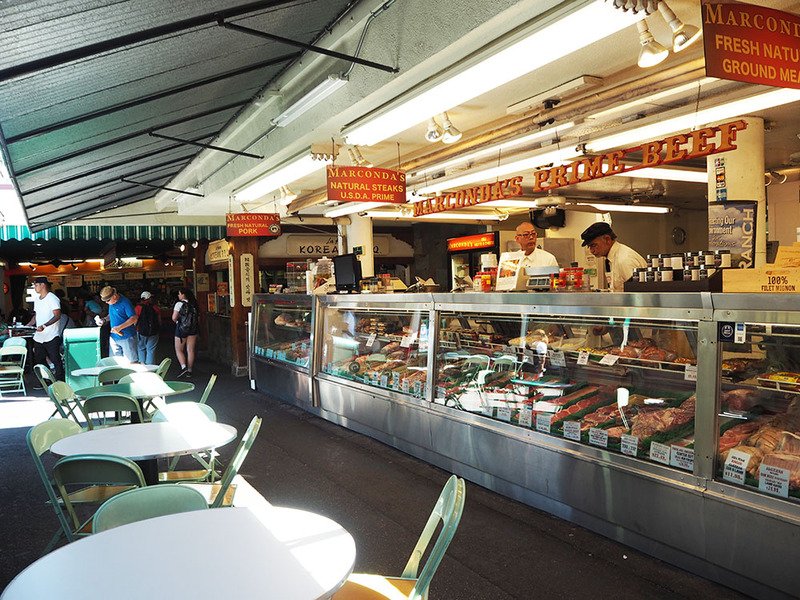 From fresh fruit, to meat and veg, to sweets and ice cream, it’s got it all! 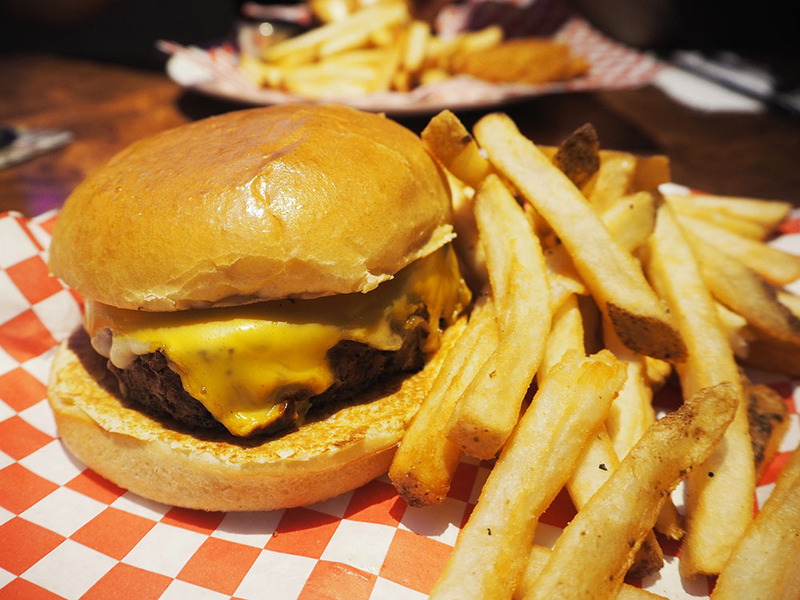 As well as a huge range of food to eat for lunch. 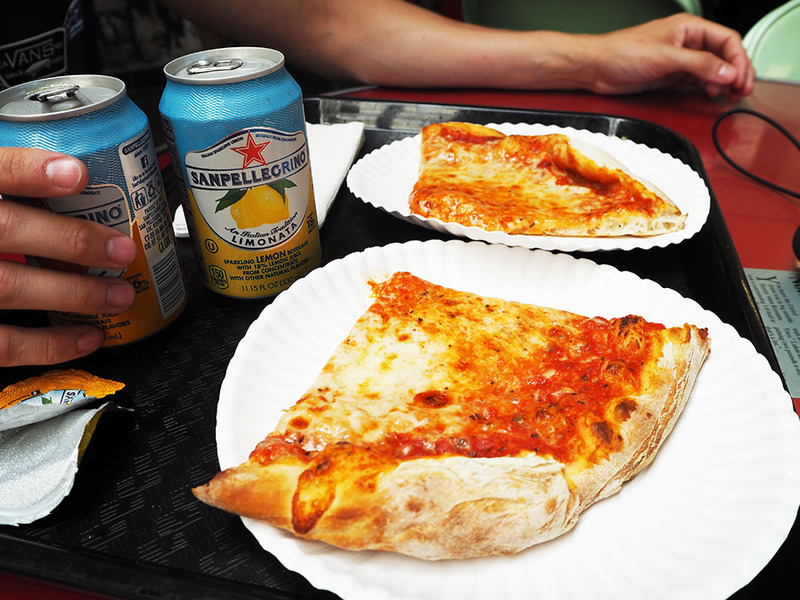 We decided to settle on some pizza from Patsy D’Amore’s Pizza, and I can verify that it was deee-lightful! After lunch we wandered out into The Grove which is adjacent to the Farmers Market. 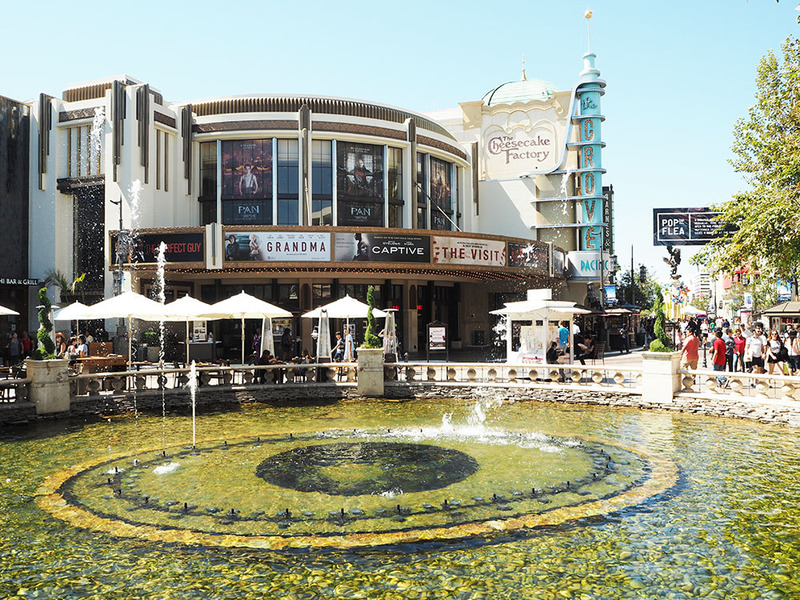 It’s full of shops, restaurants and a cinema and is set out in the most gorgeous way. As we were only there for an hour we didn’t really have much time to peruse the shops so we just had a little stroll around outside and took a few snaps. 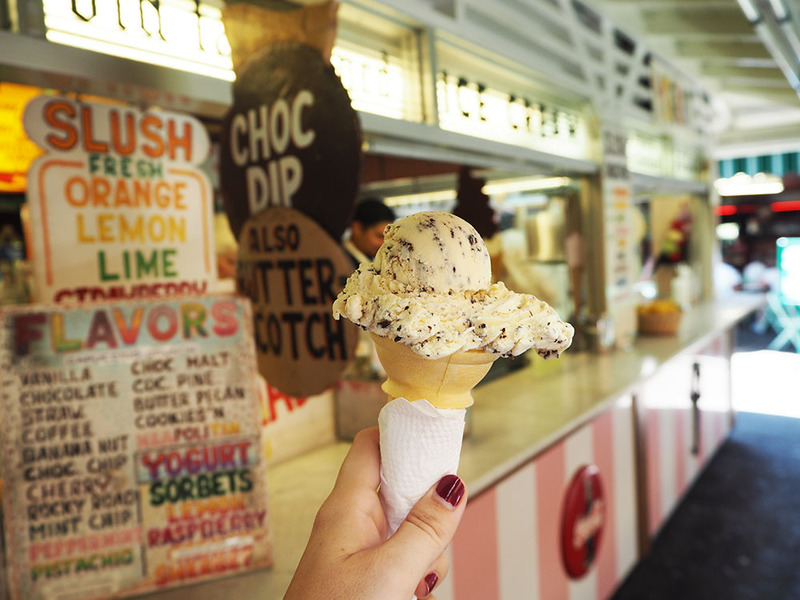 Before we made our way back to the coach, we made sure we had time for one more little stop off at the Farmers Market to pick up an ice cream! Again, I can confirm it was grand! 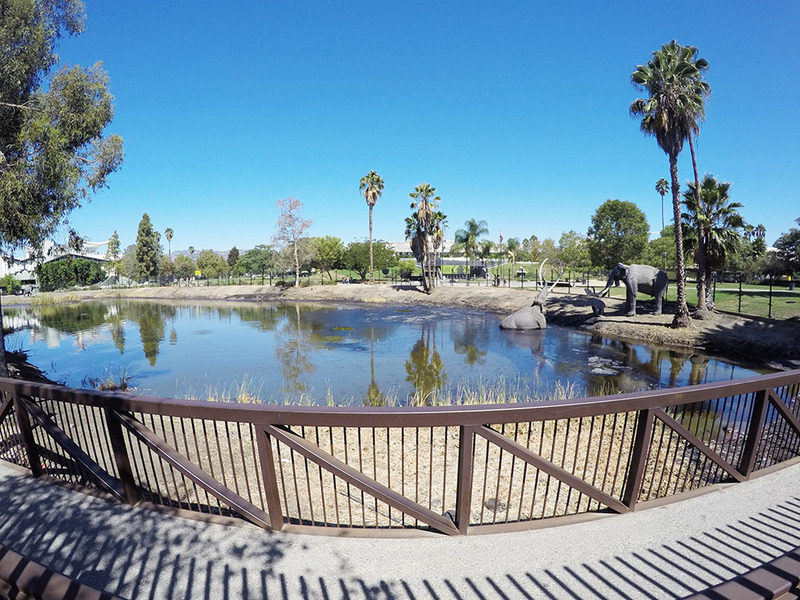 Carrying on with our tour, we stopped by the La Brea Tar Pits, which I don’t know too much about as we didn’t go in but in brief it’s where they found loads of fossils and there’s now a museum about it all. I sound so intelligent don’t I. But if you are interested in that kinda shizz, find out more on their website. They’ll explain it a lot better than dumbo over here. We also saw the Walt Disney Concert Hall which as you can see is pretty damn awesome-looking. 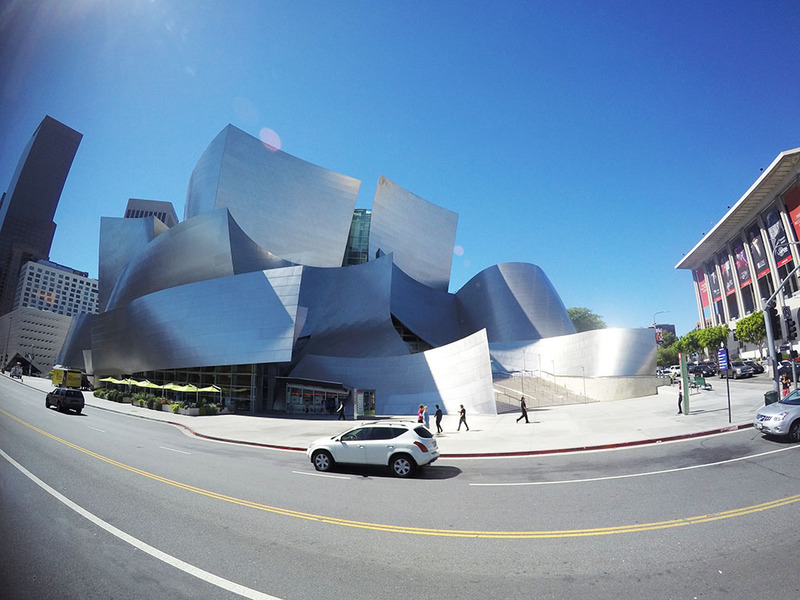 Another bucket list entry – see a show at the Disney Concert Hall. 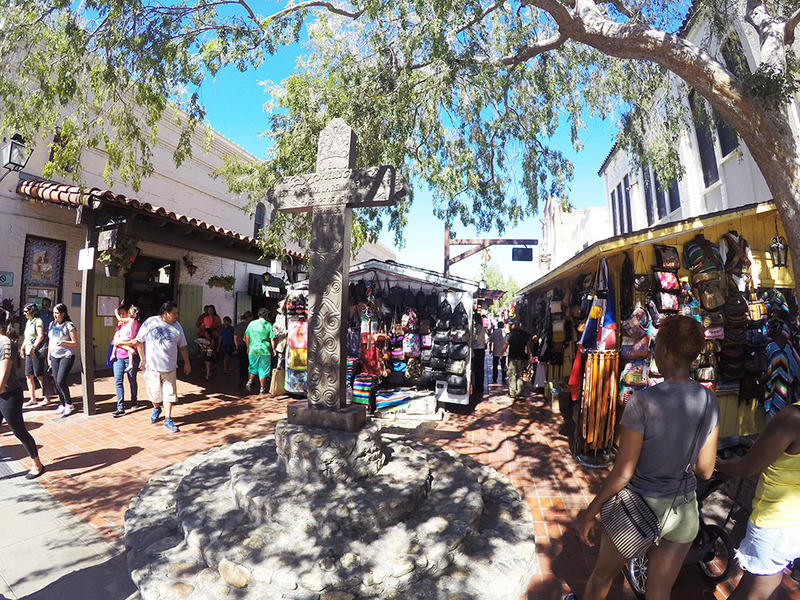 The final stop on the tour was Olvera Street, the oldest street in LA. It was really interesting and had loads of gorgeous stalls with trinkets and souvenirs to buy, including some beautiful leather bags that were a little out of my price range! 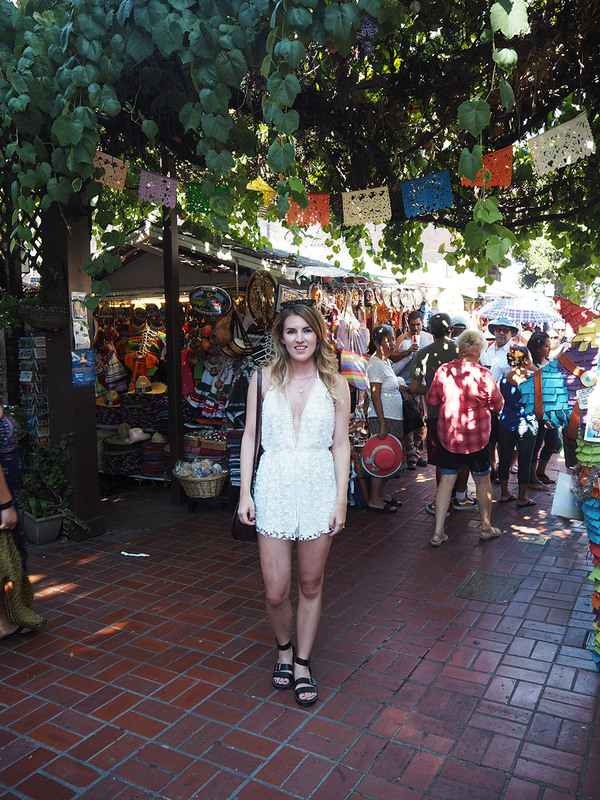 We also went into the oldest house in LA which I think was free to enter, so definitely check that out if you fancy finding out a bit more about the history of LA. After we finished on the tour we headed back to the hotel to freshen up and collect our car, before making our way up to Griffith Observatory. I had been here on my last visit to LA and I knew Luke would love it so I made sure we had time to go. Anyone who knows me will know that I hate space, it freaks me out. 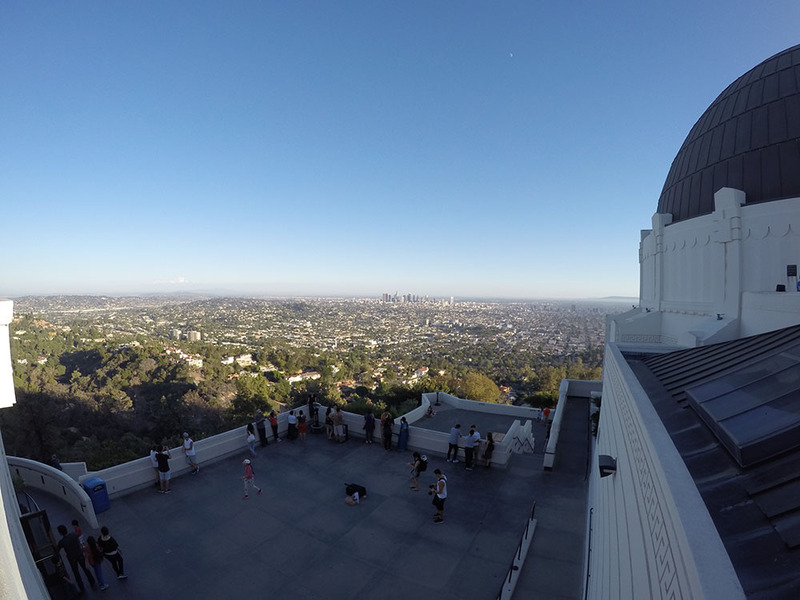 So being at such a space-focused place might seem a bit weird but the view of LA from this place are UNREAL. And we arrived just in time to take a few photos before the sun started to set, the perfect time to be there so you get to see the view in the daylight and at night with a full blanket of lights twinkling below you. I honestly adore this place and would hugely recommend it. You can get public transport I think, but we decided to drive and park. 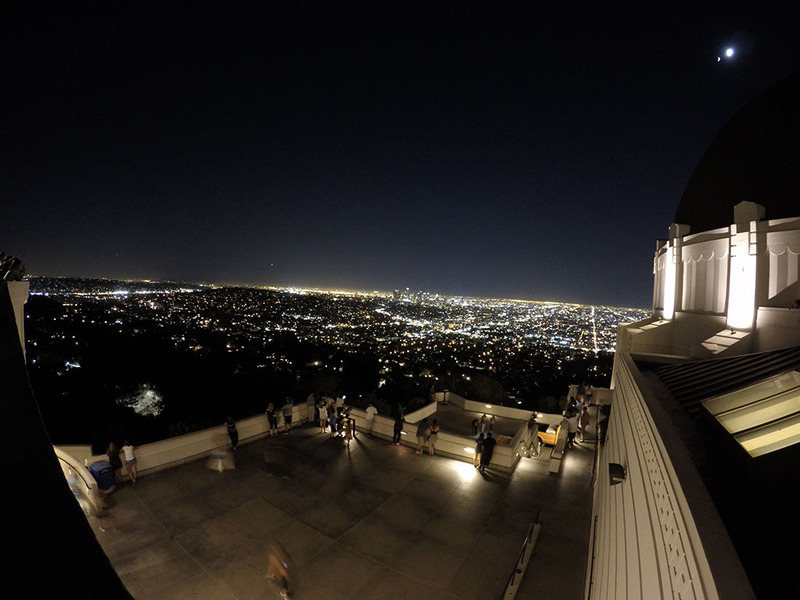 There is limited parking at the top, but you can park all along the roads on the way up to it for free, which is what me and Luke did, and then made about a 5 minute walk up the hill to the observatory. 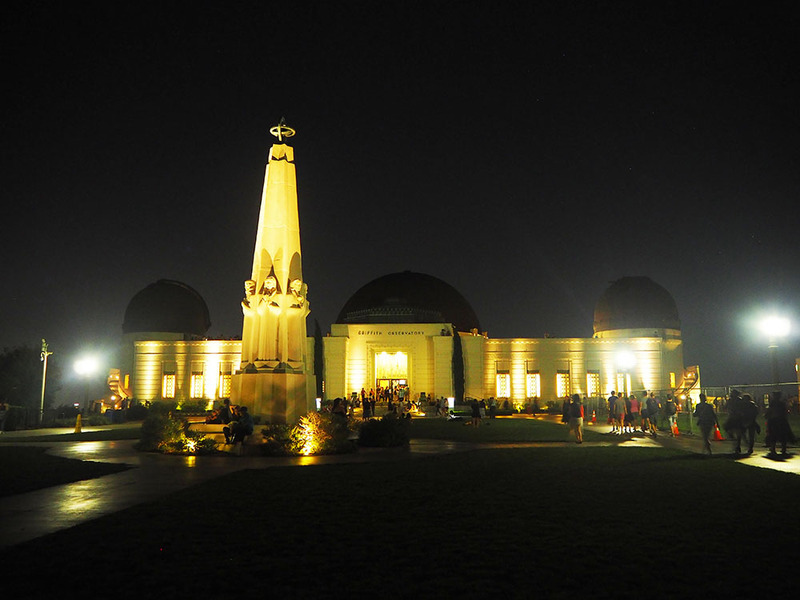 It’s also free to get into the observatory, you only need to pay for the planetarium tickets. This is the view that I came for, that gorgeous sunset! 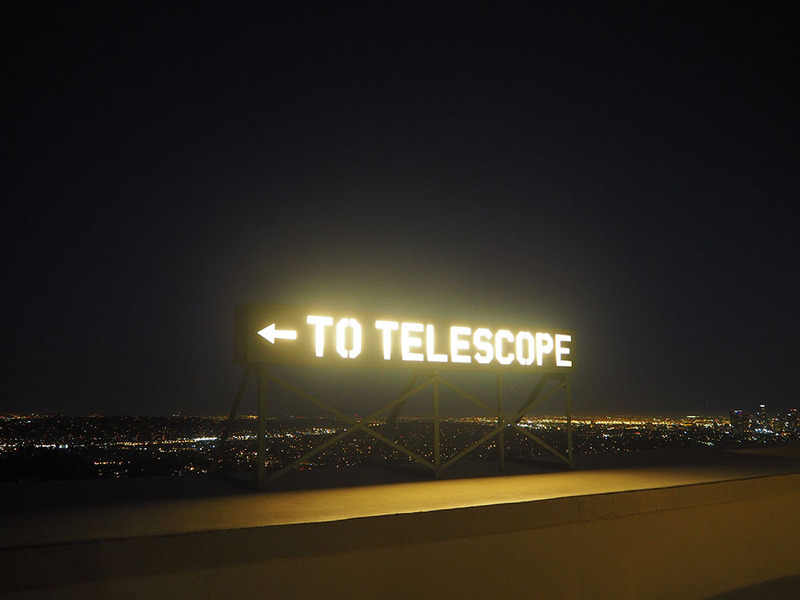 Once the sun sets, the telescope opens, which you can queue up to take a peek through. 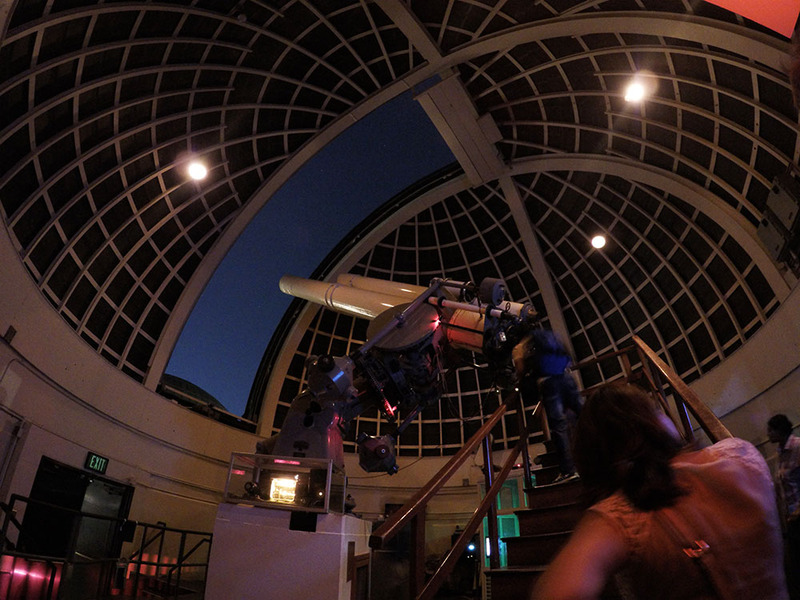 Inside the observatory itself there are loads of exhibits and a couple of planetarium shows you can go and see. There’s also a really interesting film you can watch for free about the renovation of the observatory several years ago to create an underground area. Luke was gutted we didn’t go to the actual planetarium show because I was too worried it would freak me out, but we have promised next time that we will go and see it. Because I am promising you and me that I will definitely be going back to this gorgeous place! 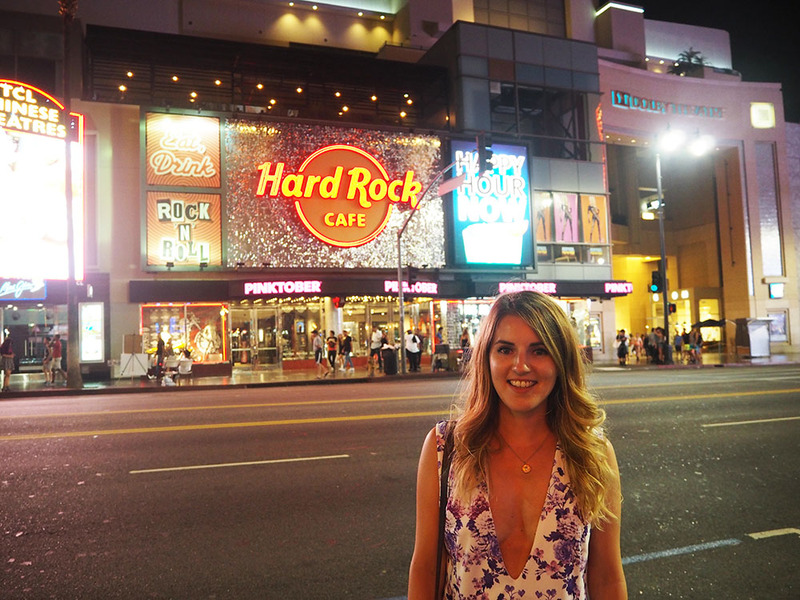 After getting back from the observatory we quickly got changed and headed out onto Hollywood Boulevard, which was literally around the corner from our hotel, for a spot of dinner and a stroll along the Walk of Fame! 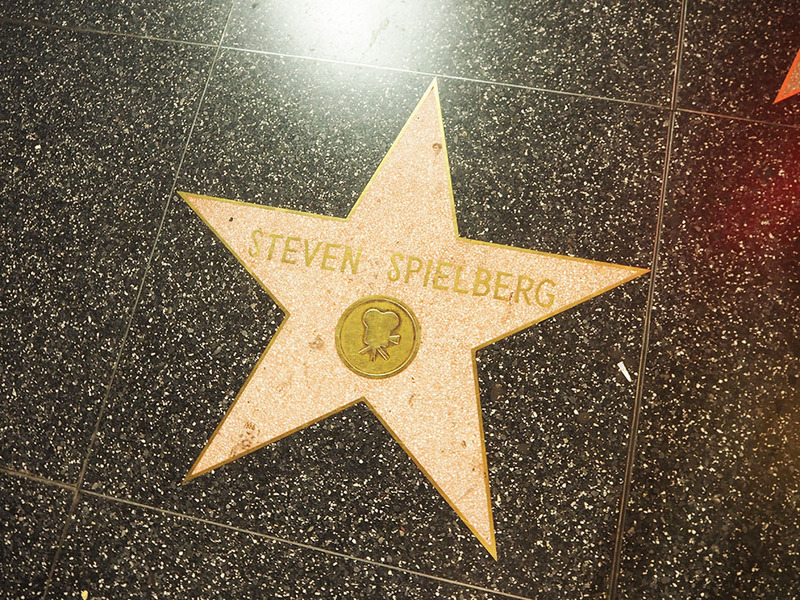 If you want my honest opinion, the Walk of Fame ain’t all that if you ask me, the handprints outside Grauman’s Chinese Theatre are sooooo much better. For dinner obviously we had to get the final Hard Rock in for the holiday! 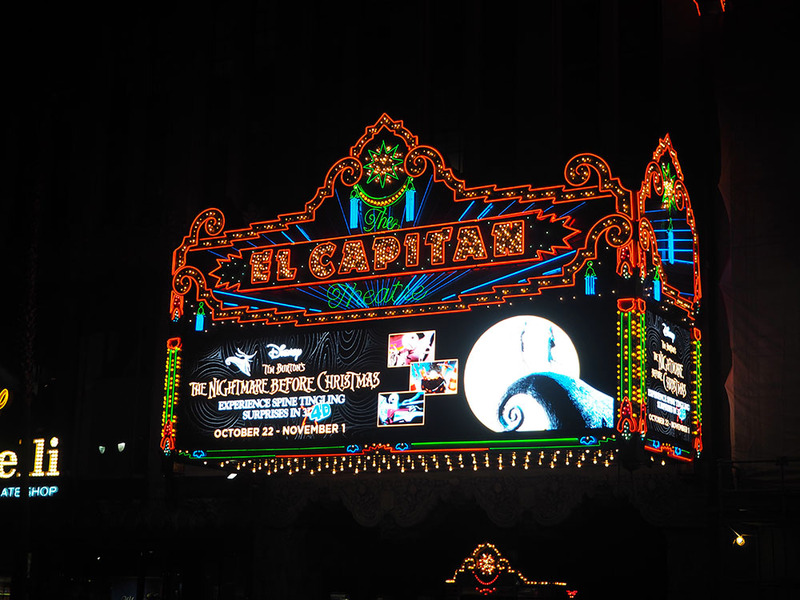 After we finished our meal we wandered back out onto Hollywood Boulevard and I spotted another attraction I definitely want to come back to, the El Capitan theatre. This is where Disney movies premiere and every day they show Disney films for the general public to view like the cinema. We didn’t get a chance to go as we had such a packed schedule, but its just another thing to add to my ‘next time’ list! 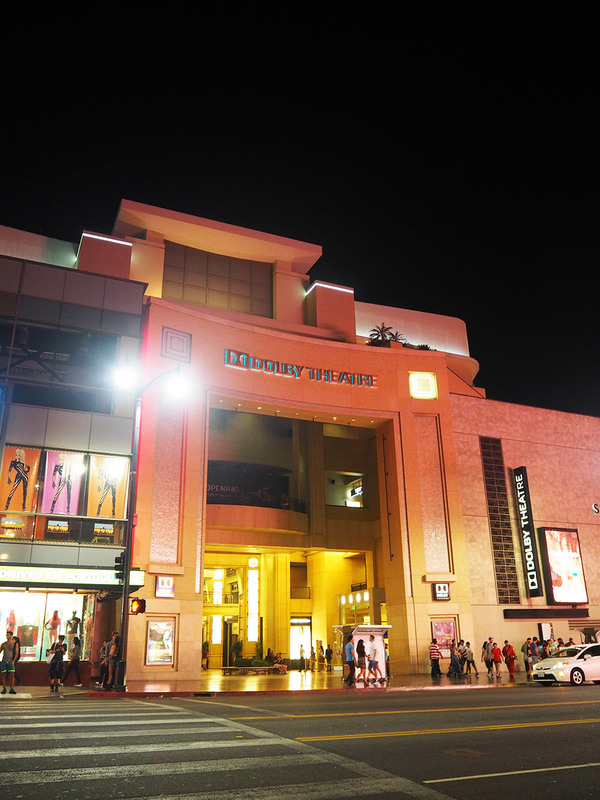 There’s also the Dolby Theatre which is where the Oscars are held every year. When I went with my mum we went on a tour inside the theatre itself which was really interesting so if you’re a fan of movies or the Oscars then that could be a great thing to look into doing. 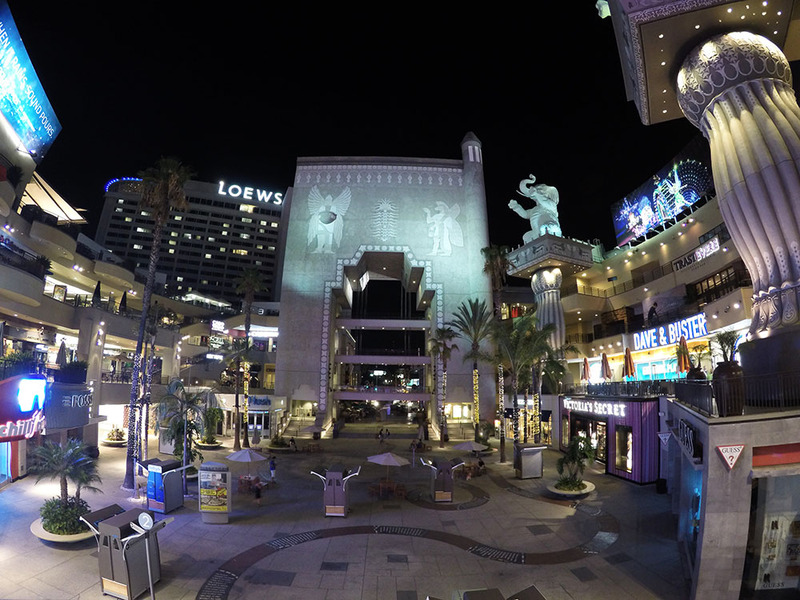 We finished our evening by walking back through the Hollywood & Highland centre to our hotel. 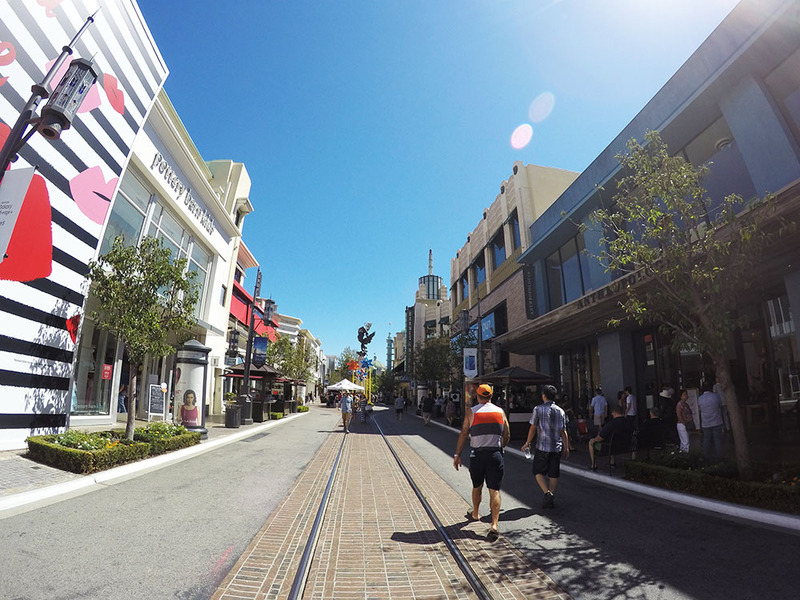 The centre is home to a whole bunch of shops and restaurants and is right on Hollywood Boulevard. It’s also right by our hotel, you can see the Loews logo peeking out on the left of the picture. A great end to a fantastic first day in LA! Also if you’ve made it to the end of this ridonkulously huge post then thank you and you probably deserve a medal.